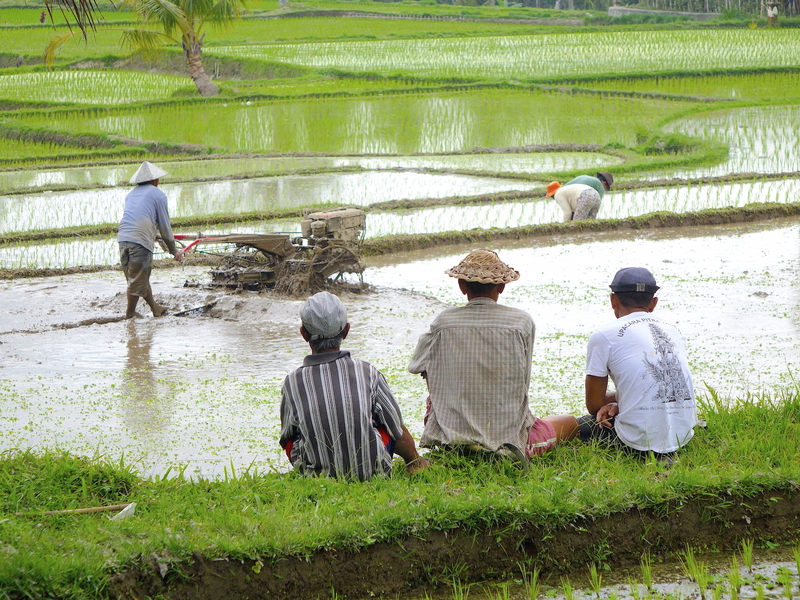 Even for the Balinese, preparing the rice paddy–something that happens most days somewhere on the island–holds an extra-ordinary sense of the ordinary becoming more than ordinary, something close to spiritual. But today, maybe it’s that a motorized plow has replaced the water buffalo, and is now simply extraordinary. What appears extraordinary to me is that straw hats are more and more being replaced by sun hats and ballcaps. Extraordinarily sad for the photographing traveler. That’s so interesting. But does the noise from the motor offend them at all? There must have been a peaceful aspect to trudging along behind that water buffalo. Good heavens! I may never go near the toity again! LOL What an interesting video! Scary, I know, huh! I admit, I think of rats as city dwellers, and thought it “odd” that they would live in the wilds of a rice field. Yeah, the motor is…well, a motor. And big. And fairly loud, but you are in a vast rice field that soaks up the noise or blows it away. Still, it’s not a buffalo. And although the motor plow is interesting, the buffalo is a much better photo. Yet, perhaps a little slower at doing the job….which would make it much more peaceful with him. I couldn’t watch it. As soon as I saw that wriggly thing in the toilet I had to turn it off. I would have nightmares. Okay, so I’m a woos. You are a wuss…someone corrected my spelling of woos once. I didn’t even think it was a word. Thank you for saying it. You’re still braver than I was. I wasn’t even prepared to open it! Hey, girls. It’s just a cute little rat. Not even a big one, and it’s got cool info. Yes the traveler will see a much different world in the next decade. When we were in Peru the older generation were often in the fields in traditional dress but never the young adults unless for photo purposes. It made me glad I had come to visit now rather than later. Change comes to everything making it extraordinary. Thank you for the link to the rats in the toilet. Just loved it and the information it gave. I particularly liked the rats swimming at the end. They looked adorable. Their ribs caving in got to me!! What in the line of evolution would allow for that? I really wish I hadn’t watched that video! I know! Scary stuff. I hate rats. It just doesn’t look so romantic without the water buffaloes and of course the hats too. But extraordinary how times are changing. Youtube never ceases to amaze and astound me. Is there any thing that hasn’t been youtubed? Right…what is wrong with this picture is all I’m saying. Interesting stuff, but where’s the water buffalo? If this wasn’t so adorable, I would have been totally freaked out. The rat on the little raft, those little feet paddling madly–too cute! Rats in my toilet–not so much. Right…rats in nobody’s toilet is what I’m voting for. Cute…not so much! You’ve managed to link the ideas of ordinary/extraordinary and the inevitability of change in that one photo which, by the way, is so excellent and beautiful. I love the distant reflection of the grasses in the water and the old and the new in two foreground layers of the picture. Too scared to watch the video …! Yeah…you are too timid to see such things as mice in your toilet! I’m glad you like the shot. When I took it, I had mostly the three guys in mind…as foreground for the field. I dare you to watch the video! A dare?! I guess if I can climb Huayna Picchu, I can watch a rat video … and I did. Not so bad at all – I was expecting multiple scenes of people screaming as rats emerged from their toilets, but the measured scientific voice managed to tamp down any hysteria on my part! HA! Yeah, amazing what tricks we play on ourselves. I don’t like rats. But they are somebody’s mother. Rice fields are beautiful. I sometimes drive around in California just to look at them. Great post! they have rice fields in California? I never saw them there. You LIVE in California? You look like you should live in…Sweden or …? Yes, they have rice fields. You can see them just driving up the I-5. I don’t live in California, but I did live there for three years. Right now I’m right next doors, in Nevada. I am originally form Sweden. Cool. I lived in SoCal for 10 years, ages ago…never saw rice though! You didn’t know that? Where have you been Badfish? all that time in Cali and you missed that? They around the Sacramento Valley area. We used to fly over them and drive by them when I was “stew” on the way to the hotel. No. I never saw them…or didn’t recognize it as rice. I was usually on the coast when driving, though. I’m sure they weren’t growing the stuff in San Diego??? Great entry! I love paddy field – and you know, there are plenty rats as well there. Indonesians called it tikus sawah. Since I didn’t write about the walk, I didn’t enter in your Walk. Is one photo enough…or do you like to see a few, and hear some words on the walk? Morning! 🙂 Sun’s still trying to get out of bed here. I do say ‘no rules’ and I wouldn’t spurn you, but I do prefer a bit of to and fro. Added to which, there are already quite a lot of posts added this week. If there are too many I worry that people can’t spare the time to visit everyone. Did you get any new visitors from mine last time? I think so! But I didn’t really check to see if they were from yours or from the WP prompts. But I thought at the time, they were from your cite. I’m working on my next piece…with some walking, but mostly biking, I’ll link that one. nothing sad about doing it on the blog!!! I can imagine that preparing a rice paddy (or any garden) has always been a spiritual experience, until technology made it more mundane at the want of a new generation. But as an onlooker, it is easy for me to say that. Second thought… great vid on our little Rattus friends. Not so random fact: Fossil record dates back to the Paleocene on the supercontinent of Laurasia. Yeah…getting your hands and feet in the dirt just has to “ground” a person, move you toward a spiritual place, I’d agree. Rats: yikes! So they’ll probably right here with the ants and cockroaches when humans are gone! …and see, here you are treating me to another exceptional picture of Rice Paddies. Magnificent. It reminded me of you!! Wonderful photo, Badfish and extraordinary transformation. I guess that as much as us, tourists, would like to see things just as they were, these people have to make their living and compete with others, who are better equipped than they are. Reality’s trade off is most often not reasonable. And now this video…even though it is about rats, I liked it so much. Is there one for geckos? Yes, rice is one very labor-intensive crop to grow. It’ll probably never be quite like other crops, it will always need someone to go in there and weed, and stuff. But the water buffalo may be phased out. This machine is faster and you don’t have to feed it when you’re not using it. I’ll check to see if there’s a gecko video! To them, the caps probably seem cool because they’re extraordinary, while the hats they’ve always had are simply ordinary. The old things we might think are so interesting are often things that were hard to use and not particularly efficient, so those who used them are probably glad for the new and “better.” Point of view has a lot to do with it, doesn’t it? Janet…you are absolutely right, I think. Everybody is wearing ball caps. And drinking Coke and Starbucks. And right…everything is relative! Glad you liked it. Thanks for hanging out here and commenting!! I need to visit you more often! You’re welcome any time. Love to have you. I like your site, too!! It’s a creepiest and perfect for Halloween!! No, gracias, I’m not going to check out these rats. But the mention of hats has reminded me of this story, which happened not on Bali at all (maybe in Vietnam?). A (Slovenian) friend was cycling around with his friend and they were in awe of the locals and their wide hats. They wished a couple for themselves and got some. When they were wearing them cycling around, they were getting really lots of laughter and snickering their way. They thought foreigners and all. Until a kind soul explained to them that instead of buying a hat they managed to acquire a pair of rice sieves. Hahahahahaha! Tourists!! Gotta love um. I’m drafting a bill to submit to the Bali Congress on just this issue. I’m sure they’ll give a hoot. and all about rats huh? just checked out the rats in the toilet video – it is very well made and was not what I was expecting – nice graphics and wow is that crazy to find one day while lifting the lid…. yeah, I thought it was cool…and the way they collapse their rib cage!! a long-sleeve GAP t-shirt…I’ll give you a thousand dollars for it! Ha! And like I said – it is not as old as the one you posted about it – but old enough to have that well made quality and higher grade cotton…. Was walking by the gap store earlier and they aw carrying the “peanuts” line – snoopy was everywhere – but no classic black tees like yours – !! I’m sure the water buffalo are none too pleased with the situation either. Now that they are unemployed, what is life like for them? Maybe it’s sort of like when they put race horses out to stud??? Maybe it’s just eat grass and stud all day? Evolution seems to go on everyday…despite what people think or want eh? Just wish I could catch up, I seem to be behind in mine! Great photo as usual! Evolution. Name of the game. Dinosaurs didn’t want it either. But yeah, my evolution seems a bit slow too. Yeah, the West is globalizing everything, making things Western. Some of that is good, some of it bad. Ballcaps and buffalo loss…those may be bad. You are right, the changes wrought by progress is extraordinarily sad for tourists. But it must make a world of a difference to locals. No thanks for that link Badfish….I might never go near a toilet again without worrying about lurking surprises beneath the seat! Eww!! HA! Actually, the video was well done, and not scary at all. Even others commented on how gentle it was. It is a shame from an aesthetic point of view about the demise of the straw hats. I also wonder about it from a practical point of view. Somehow I imagine straw hats being better at keeping people’s head cool and preventing sunburn. It would be a particular shame if the reason for their disappearance is not even based on practicalities. Maybe baseball caps are just cheaper or easier to wash.
Bun, a shame is right. But I believe it’s worse than you imagine (cheap or easy to wash). I’d like to believe they were more practical, but ballcaps don’t keep the sun off your ears or neck. I believe it’s just that it’s more American, or Western. I feared as much. Short-term fashion trends are an awful reason for destroying local cultures and customs. Once all the little companies that make such products go out of business and the craftspeople who have the skills die off, it will be to late to bring the traditions back again. I’m ambivalent about some cultural changes, like language, but I will miss seeing certain things, like saris and pointy hats, if everything goes Western everywhere. Noisy motor and ball caps aside, I find agriculture in other reaches of the world fascinating. Oh…that is SOOO true. I love watching them work in the fields. I love the fields. I love to watch them do other things, too, like their celebrations or funerals or how they make coffee.